Tuff Trap Skunk 24" x 6" (ADC6) Northern Sport Co. This trap is very heavy duty with a guillotine style solid steel door that has been powder coated. 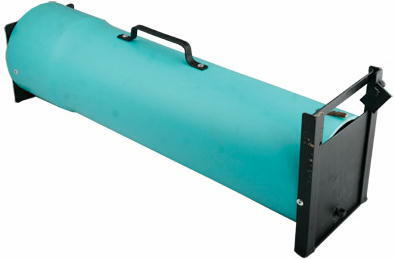 It is made from a 6" diameter, 3/16" thick pipe, 24" long, and has a solid steel backplate. A skunk can not spray while in this trap, they can not lift their tail, arch their back, or see out. They can be easily transported. Great for ADC work, and heavy duty enough to be thrown in the back of the truck to move onto the next job. Or, for that pesky skunk digging under the house, the guillotine style door allows you to place the trap right up to the hole. Can also be used for squirrles, cats, oppossum or any small critter. This warranty covers all manufacturing errors and normal wear and tear that would cause the Tuff Trap to not perform properly. Warranty becomes void if the Tuff Trap has been altered from its' original condition in any way. Warranty is for repair or replacement, a refund is not available. **Over-size shipping may apply to this item. **Multiple traps on one order will be subject to actual shipping. **By adding this item to your order you are agreeing to pay any additional shipping charges or actual shipping costs that will be added to your credit card before shipping.